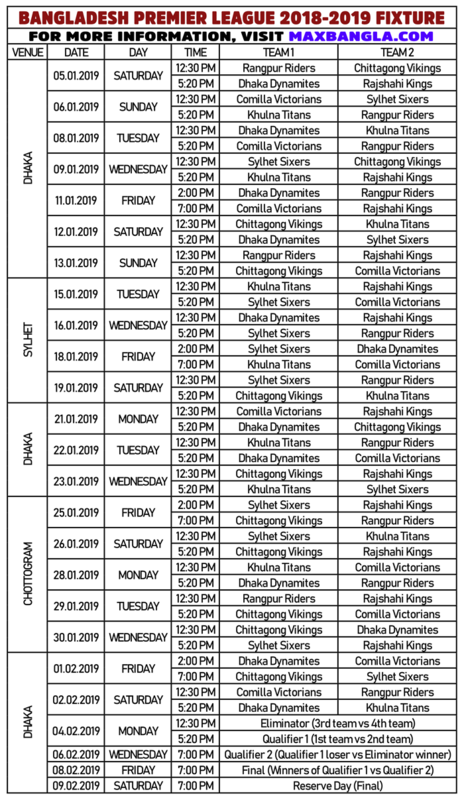 Bangladesh Premier League BPL T20 2019 has been started from 5th January 2019. This is the 6th season of this heavily exciting tournament. As you know, the 1st and 2nd seasons champion was Dhaka Gladiators. Astonishingly, the third season champion was the new team Comilla Victorians. Mashrafe Mortaza won all the 3 seasons championship as a captain. In the 4th season, Dhaka team regained their championship title under the new management and with their new name Dhaka Dynamites. Mashrafe struck again by winning his 4th BPL championship as a captain in BPL 5 when Rangpur Riders won due to his magic touch. This time, like the previous season, a total of 7 teams are participating in the tournament in 2019. 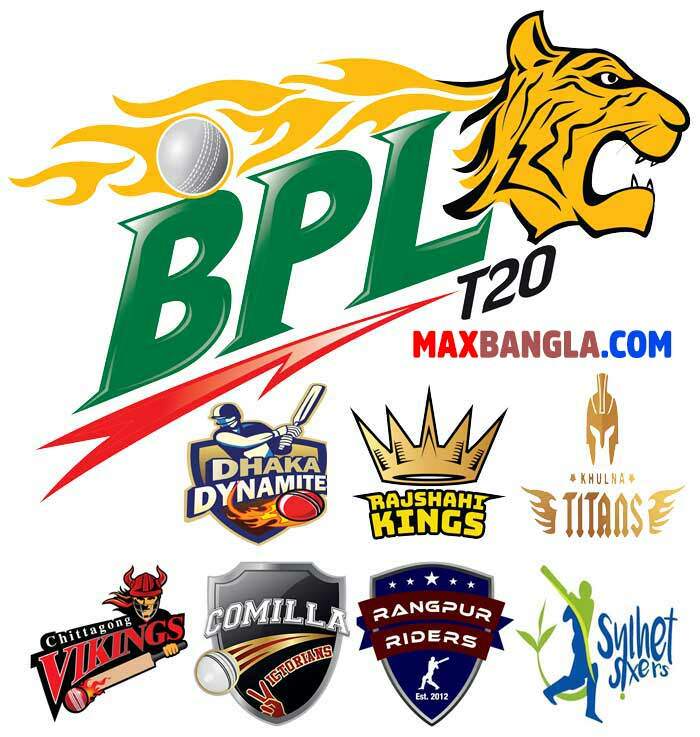 BPL T20 2019 is being held with 7 teams. Here are the teams for BPL T20 2019 along with their official Facebook Pages and Owners. Icon Players are the most valuable players in a team. There are 7 icon players in BPL 6. They were selected by BCB. BCB also decided their teams. Here are the 7 icons players of BPL T20 2019. Ticket price information of BPL T20 2019 has been announced. ➤ The 1st phase (Dhaka phase) tickets are available from 3rd January 2019 at Mirpur Indoor Stadium and Sher-E-Bangla National Stadium (Gate 1 booth). These tickets will be available from 9 a.m. to 6 p.m.
➤ The 2nd phase (Sylhet phase) tickets will be available from 14th January 2019 at either Divisional Stadium or Sylhet International Stadium (not fixed yet). ➤ The 3rd phase (Dhaka phase) tickets will be available from 20th January 2019. ➤ The 4th phase (Chittagong phase) tickets will be available from 24th January 2019 at M. A. Aziz Stadium and Zohur Ahmed Stadium. ➤ The Last phase (Dhaka phase) tickets will be available from 31st January. You can also buy BPL T20 2019 Tickets online from Shohoz.com. N.B. One person can enjoy 2 matches on the same day with just one ticket. BPL 6 players draft date was fixed on 28th October 2018. Like the previous year, franchises were able to pick up players by choice before and after the auction. The auction occurred for the players who are yet to be picked up by the teams. The player draft was held in the ballroom of Radisson Blu Water Garden Hotel, Dhaka from 11:00 A.M. The live telecast of this event was available on GTV. For the first time in the history of any T20 leagues around the world, BPL teams will be allowed to take up to 5 foreign players in their teams in all matches if they want. As the team number has increased, there will be a shortage of local players in all the teams. Hence the decision has been taken by BPL Governing Council. When 2 teams finish with the equal points in the table, then the team which won the matches played between those two teams, will be positioned above the loser team. If both the teams have one win each, then the Net Run Rate will be considered and the team with the higher NRR will be placed above the other team. When 3 or more teams finish with the equal points in the table, then the team/teams which won the maximum number of matches in between those equal teams will be positioned above the other teams. If still, two or more teams have equal numbers of wins, then the Net Run Rate will be considered and the teams will be positioned according to the NRR. When two or more teams still have equal NRR (nearly impossible), then those teams will be positioned by the drawing of lots. If the semi-finals, eliminator or final match can’t be completed with a minimum number of overs (decided by the match officials) or a tie occurs, then one over eliminator will take place. When the teams still face a tie in the one over eliminator, then the winner will be decided by the toss of a coin. NET RUN RATE: The Net Run Rate is the ratio of two numbers. The numerator is the average number of runs scored by that team per over in all the matches it played. The denominator is the average number of runs scored by the other teams against that team in all the matches it played. If a team is all out before 20 overs, then the calculation will still consider 20 overs for both the teams. That means, if a team makes 100 runs for 10 wickets in 18 overs, the average runs per over will be calculated as 100/20, not 100/18. And the opposition team’s calculation will be with 20 overs also. Net Run Rate will be calculated for the completed matches only where results can be achieved. There was no opening ceremony before the tournament. The 11th General Election of Bangladesh was held on 30th December 2018. Due to this reason, there was little time for the BCB to arrange an opening ceremony. In the first 3 seasons of BPL, they arranged the opening ceremony. The last two seasons were devoid of the opening ceremony due to a shortage of time and helping the flood-affected people in the country by donating the money respectively. Impress Mantra Consortium has got the right to telecast all the live matches of BPL 6 with the local TV channels GTV (Gazi TV) and Masranga TV. They will be doing this for the next BPL season (2020) also. Radio partners of BPL 6 are Radio Bhoomi and Radio Shadhin. Here are the team logos of BPL T20 2019. Alphabetically, these are the logos of Chittagong Vikings, Comilla Victorians, Dhaka Dynamites, Khulna Titans, Rajshahi Kings, Rangpur Riders, and Sylhet Sixers.